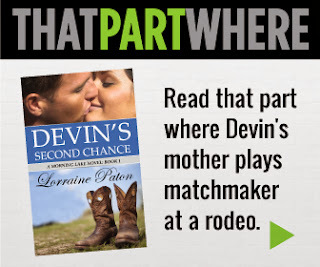 Lorraine Paton: That Part Where is featuring Devin's Second Chance today!! That Part Where is featuring Devin's Second Chance today!! Have you read Devin's Second Chance? the website That Part Where today! Check it out to read an excerpt! So what is That Part Where? From their website: "Here on That Part Where you’ll find the book beyond the cover. You’ll get a taste of the scenes, characters and the parts that make the story great. Each selection is chosen by the author to give you an idea of what lies within the pages and the thousands of words of their book. We’ll feature a different book each day so be sure and check back often." Devin's mother was cute and fun as a matchmaker I thought. I love when characters play matchmaker, especially when there are bumps along the way. Devin's mother was a fun character and a great addition to the story!